Disclaimer: Some of technical data might not be 100% accurate since most of the manufactures do not publish their specs. Dynos have proven stock TB22/TB02 turbos will max out at around 400rwhp. There's a wide range of bolt-on turbo upgrades available. JWT turbos: Jim Wolf Technology convensional bearing turbos are based on the older Garrett 'T' turbo designs. The newer JWT turbos are Garrett GT ball bearing turbos. Garrett Hybrid 'T28': Most of the T28s I've seen are only T28 compressor wheel stuffed in the stock housing. They NEVER produced any good results. Most often, they do damage to your engine because of the excessive heat generated by the incorrect housing. Experience has shown they're not worth buying. Greddy turbos: Greddy modifies Mitsubishi turbos. They share the same turbo designations, the wheels' specs are probably the same. The housings are different. Greddy never gives out any specs nor compressor maps on them. I'll be using Mitsubishi specs to assume Greddy specs. HKS: HKS uses Garrett GT turbos. There're some non-bolt-on turbos that will requeire some custom work. I will talk about them later in this site. TD05, GT2530, T78, T72... What do those terms mean? Garrett basically has two lines of turbos. 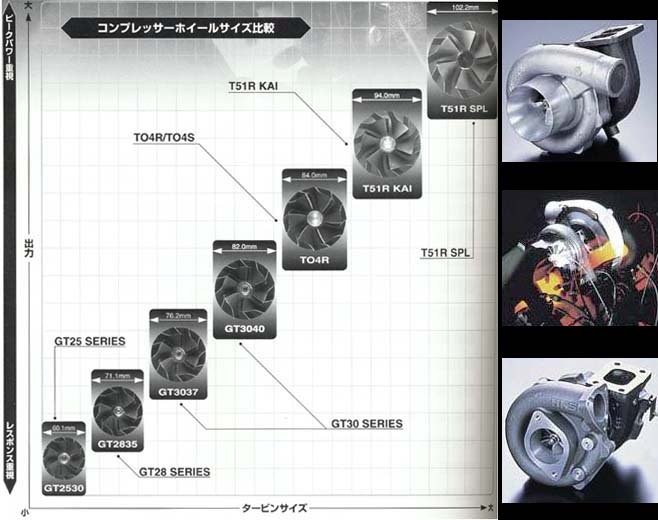 The ancient, inefficient T series turbos and the new, modern, ball bearing GT series turbos. 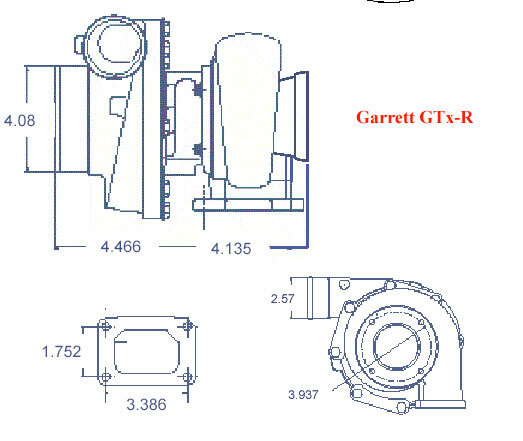 The newer line of GT turbos are ball bearing on journal and thrust bearing. The turbine and compressor wheels are improvely aerodynamically to flow more air. GT20, GT22, GT25, GT30, GT35, GT40, GT45, ... GT turbos produce slightly more hp then older T series turbos with the same number designation. A GT Garrett turbine wheel wil flow more air than similar sized Greddy turbine wheel. Thus GT turbos are able to boost higher and flow more. 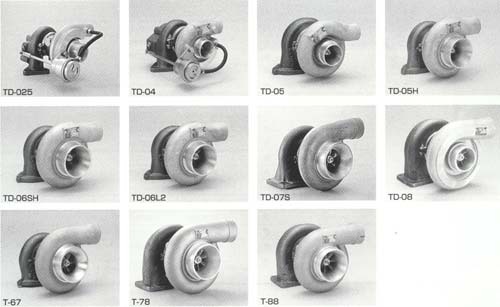 T family has T22, T25, T3, T350, To4B, To4E, TS04, To4R ...These are 50 year old, WWII generation turbos. 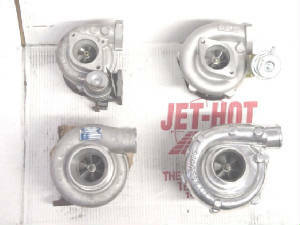 Turbonetics and many domestic makers turbos based on T series turbos. A T3/To4E 60 T .63A/R is a hybrid turbo with T3 turbine, To4E compressor, 60 Trim compressor wheel and .63 A/R turbine housing. Wheel "trim" refers to the squared ratio of the smaller diameter divided by the larger diameter times 100. Generally, the larger the trim number the more flow the wheel has. For compressor wheels , larger trim tends to mean slightly lower efficiency. For "families" of turbine wheels (those with the same inducer diameter), larger trim usually means better flow with less backpressure but longer spool time. A/R is a ratio of the exhaust discharge area vs the distance from the center of turbine wheel to the center of the cross sectional area. Smaller A/R housing has faster spool up. Bigger A/R housing has less back pressure, more flow for the top end. The so called "T-series': T60, T61, T66, T70, T72, T76... are T4 turbos as well. The number means the compressor inducer size. ie: T76 means it has 76mm compressor inducer. 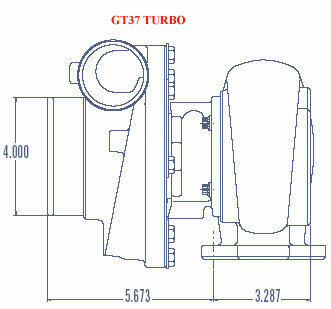 GT28RS is a hybrid of GT28 turbine mated to 62 trim GT30 compressor. GT30R is a hybrid of GT30 turbine mated to 56 trim GT37 compressor. HKS uses Garrett turbos. HKS GT series turbos use Garrett GT's turbine with GT's compressor. For example, HKS GT 2835 is GT28 turbine with GT35 52 trim compressor. 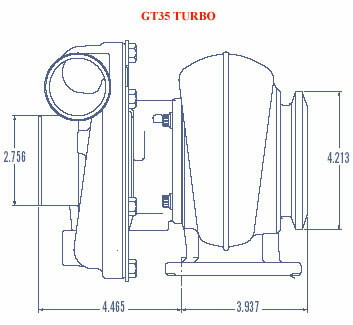 GT3037 is a hybrid of GT37 52 trim compressor and GT30 turbine. I'm working on spec'ing a newer turbo, GT30R. 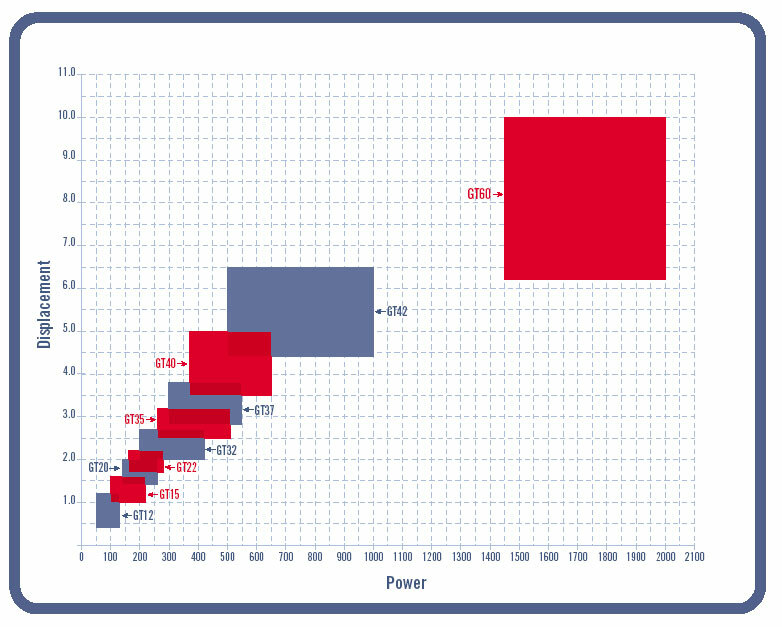 It's smaller than 3037 physically, but it flows quite a bit more and more efficient than 3037. It's a Garrett ball bearing GT turbo. It has 76mm compressor wheel, 60mm turbine wheel (same size as 3037). 60mm UHP turbine wheel, T3 inlet flange, 4" outlet, .82 a/r. Mitsu and Garrett turbos have totally different designations. Mitsubishi uses TD04, TD05, TD06, ...to designates turbo housing. TD05 turbine housing with 'H' style turbine wheel. There are S, SH, H... style of turbine wheel/housing. 16G compressor wheel. 16 is the size of the wheel, 1.83 inducer, 2.37 exducer. There is no direct correlation between MHI designation and actual physical size of the compressor wheel. G is the style of wheel (uneven height of blades). C, B, T style wheel's blades have the same height. Blades are equally spaced, but the number and pitch of the blades vary between models. 8cm^2 is referring to exhaust discharge area in the turbine housing. More specifically, it is the smallest cross-sectional area of the scroll, turbine housing. Very similar to Garrett turbo's A/R. The smaller number means faster spool-up but more back pressure at higher rpm. Bigger number means longer spool up but less back pressure, thus more top end power. Greddy modifies Mitsu turbos. I don't have any published specs for Greddy turbos and i have not taken any time to measure them. It's possible some of turbos have different specs from Mistubishi. Also, both Greddy TD05 and TD06 use 3 bolt turbine flange where as Mistubishi's uses 4 bolt flanges. Bisides the TD04, TD05, TD06, TD07 and TD08 turbos, Greddy also makes hybrid turbo, T67 is TD07 compressor and TD06 turbine, same turbo as TD06SH-25G. T78 is the compressor of TD08 and turbine of TD07, T88 uses compressor and turbine from TD08.